While we wait to see if the Air Force Hurricane Hunters will fly into Invest 91L this afternoon, I figured I would briefly go back in time to see what the chances that a system in the western Gulf of Mexico would develop in June. I am not an analog forecaster, nor do I use analogs in forecasting tropical cyclones, but with at least rainfall and precipitable water records at risk, why not look? According to the National Hurricane Center, the 2nd tropical cyclone of an average season would typically happen in August. Through more than 150 years, there have been 10 tropical cyclone formations, as seen below, in the Gulf of Mexico or over the Yucatan Peninsula with fewer in the current orange area depicted by the NHC for the area of development. Courtesy of the National Hurricane Center. Each red dots is a tropical cyclone formation since 151 in the Atlantic. In terms of June tropical cyclones developing in the same area as 91L, there are quite a few (29) storms going back into the 1850’s going in many directions. The strongest tropical cyclones seem to go toward the NW (or north) with winds generally less than 100 mph (115 mph). A secondary trend is for tropical storms to move into the northeastern Gulf. Obviously Audrey sticks out like a sore thumb as an intense hurricane, but we shouldn’t focus on the extremes but rather on trends. Historic tropical cyclone tracks over the last 150 years that have passed within the current NHC-marked area for possible development during the month of June. From NOAA. It should be noted that history has no bearing on the present, but it does offer some guidance into what can happen in terms of track and less so with intensity. 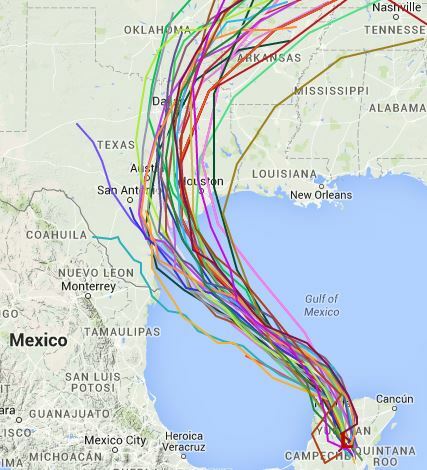 The current (06z) models show a track toward Texas without saying much more. The best bets look to bring this system into the central Texas coast, and the analog method doesn’t tell us anything about this track. The current intensity model suite almost entirely brings this system to near tropical storm intensity, whether that may be as a tropical storm or as a low pressure system. The line between those two is slim. 06Z Track Models from Tropical Atlantic. June in general tells us that we should get some less than aesthetically pleasing systems, and that’s the category this one will probably fit into. June also tells us that stations from the Rio Grande to the Mississippi River should not have precipitable water values above 2.25″, but those are forecast, tropical cyclone or not. Currently, the NWS has a coastal flood advisory in effect for parts of Louisiana and Texas just for the strong southeasterly flow that will assist 91L toward the Texas coast. Water there on Monday and Tuesday could be 3.5-4.5 feet above typical low tide levels (MLLW) with a tropical cyclone or less without a tropical cyclone. A variety of flood watches will likely go out for the southern plains and hill country either today or Monday. 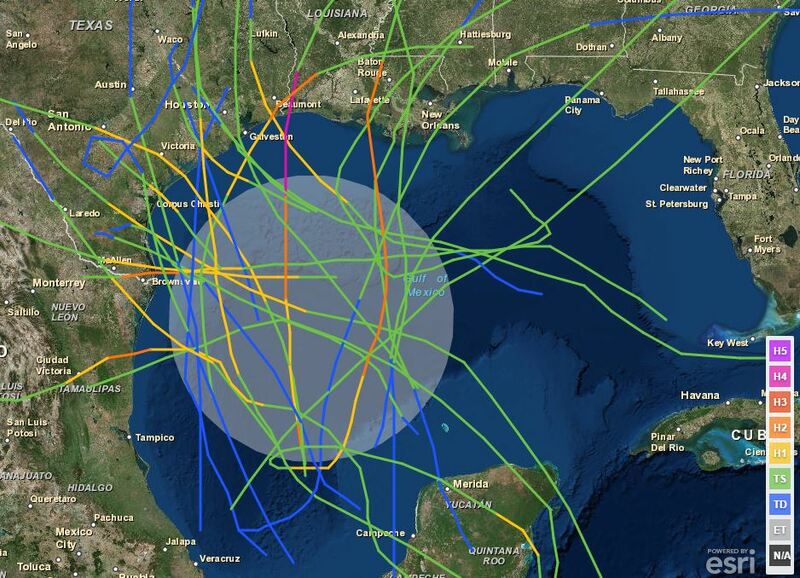 The hurricane hunters collect data that improves computer model guidance, and if they fly today they will give us a better idea of where this system will go and the impacts it will create. History can give some general guidance for a given forecast and can show us how past storms have impacted certain areas, but the impacts of this storm can and will be different. There will be no two storms exactly alike. It is best to prepare for every system before they even develop…no matter how small or weak. Posted on Sunday, June 14th, 2015, in Tropical Weather. Bookmark the permalink. Leave a comment.